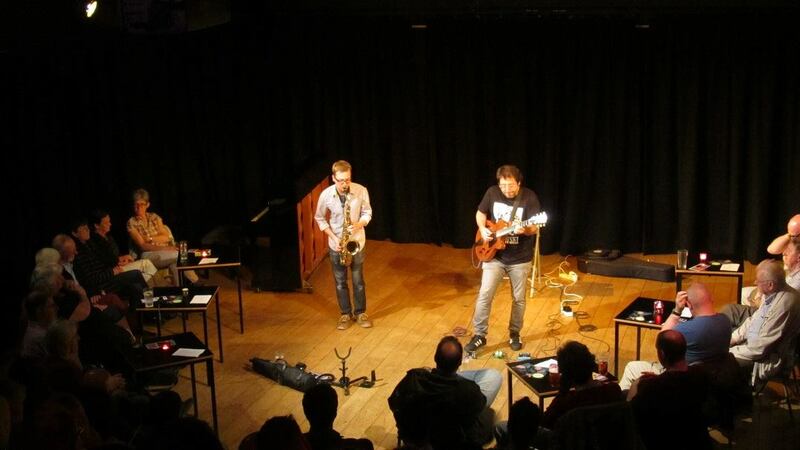 With autumn upon us, jazz venues in the North are launching their new season of gigs. Seven Jazz in Leeds has taken this opportunity to introduce two strands of gigs in their programme - Seven Jazz Unplugged and Seven Jazz Introduces. The Unplugged series has grown from their experience presenting gigs at the Inkwell and will feature a programme of groups playing acoustically. 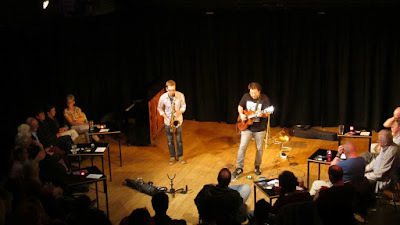 Pictured above is the Matt Anderson/Jiannis Pavlidis Duo at the first of these gigs and as you can see, the audience will be able to be in amongst the action with the new Jazz in the Round lay-out. The Seven Jazz Introduces strand features the wealth of talent produced by the jazz course at LCoM (plus some students from the music department at Leeds Uni). There are a range of gigs on Sunday afternoons featuring these groups and the main Thursday evening programme will also have support slots led by student groups. Below is the gig listings for these two strands - visit the Seven Jazz website for more information on these and all other Seven Jazz events.